Originally published in Psypress Vol XXI, my in-depth profile of the legendary cannabis smuggler is now available online. It revisits Howard's colourful career — from Oxford graduate to Mr Big, to jailbird and then author and celebrity. Along the way, I show how he carefully cultivated his own mythos, which proved to be a double-edged sword when the forces of law came after him, but gave him the material for three memoirs and hundreds of stand-up performances. Having died from cancer in 2016, he is much missed. A guest post for Morbidly Beautiful where I look into actual cases of this kind, as a counterbalance to the fiction of Literary Stalker. And indeed there is much eerie crossover between the two. For example, Stephen King constructed the most famous fictional literary stalker ever, in his novel Misery — but he had several real ones too! Find out more about the stalking of Stephen King, Peter James, Val McDermid, James Lasdun and other authors. A guest post for Machine Mean where I discuss the key influence of the film on the book, whilst performing a review and an analysis of what we love about this classic. I had the basic plot idea for Literary Stalker many years before I wrote the novel, but it remained on the back burner because it seemed too simplistic. Then I had the further idea of making the work a pastiche, with showcased references to films and other novels, very much in the style of Quentin Tarantino. Having fun developing this, one film in particular popped into my mind — Theatre of Blood — and the rest, as they say, is history. A guest post for The Haunted Reading Room, which travels the meta-road from highbrow Borges, Nabokov, John Barth, Doris Lessing and Martin Amis to the popular culture of Wes Craven’s Scream series and its sequels, where the characters are aware of real horror films and their plot devices, and use the knowledge to analyse what is happening around them, anticipating the likely pitfalls of being in a horror movie themselves. A guest post for Get Wordy, dealing with the construction of the stalker character Nick Chatterton. Nick is thirty-eight, gay, unemployed, with a full head of long hair, borderline personality disorder and a criminal record — none of which apply to myself. I also gave him a different profile as a writer to my own, though there are some similarities (we both wrote horror short stories for small press magazines). But in one particular area I fashioned Nick very much in my own image — I gave him my taste in movies and made him a movie buff. An analysis of the genre of 'metacrime', citing research done surrounding Literary Stalker and featuring Cameron McCabe's 1937 novel The Face on the Cutting Room Floor. Way ahead of it time, this work uses many meta devices, such as nested narratives and multiple narrators, self-deconstruction and rug-pulling to undermine the 'facts' of the story. It is a clever and artful work which has enriched the current scene with its rediscovery. Leaf Fielding, member of the legendary ‘Operation Julie’ ring, wrote about those experiences in To Live Outside The Law. Now he's published a second memoir, continuing with his life story, post prison. It documents volatile mood swings, relationship vicissitudes and extensive travel to far flung locations, such as the Himalayas, the beaches of Goa and rural Malawi. As ever, his writing is vivid and lucid, and he examines himself with a disarming honesty. This article was adapted from my talk at Breaking Convention 2015, held in London at Greenwich University. It has now been published by the excellent Oak Tree Review, which investigates the many branches of psychedelic culture throughout history, specialising in its manifestations in art and literature. 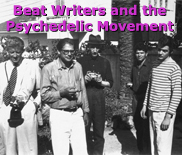 The article explores how the Beat writers were very much the precursors of the psychedelic movement, pioneering use of ayahuasca, mescaline, psilocybin and LSD, as well as the 'hippy lifestyle'. The second volume in the Nemu’s End series finds the self-styled Reverend Danny Nemu looking inwards to explore the personal apocalypse, where the veils of regular cognition are rent asunder and an unbounded world of revelation manifests beyond. He focuses on how the constrictions and convolutions of language work to dilute the divine, drawing its sting and rendering it into the conventions of whatever zeitgeist that currently obtains. My essay 'Beats on Acid', which originally appeared in Psypress UK 2014 Vol III, now features in the anthology Out of the Shadows, published by the Muswell Hill Press in July and launched at Breaking Convention. It covers the recreational and psychonautic drug experiments of Kerouac, Burroughs and Ginsberg and how they broke the ground for the counterculture movement. Review of Dr Ben Sessa's first novel, now appearing on the Psypress UK site. It features two psychiatrists setting up a psychedelic medicine centre on a muddy Somerset farm, and a supporting cast of New Age weirdos, plodding psychiatric journeymen and burnt out-headcases. It's a rip-roaring read that leaves a constant smile on the face. Psychedelic Press UK Journal 2015 Vol III, publishing in June, features my in-depth review of John Long's study Drugs and the Beats. It also includes other history-related pieces by Henrik Dahl, David Black and Sam Gandy. The 2014 Vol IV issue contains my review of Barry Miles' biography of William Burroughs, together with essays by David Luke, Ross Heaven and Simon G. Powell. Now featuring in Big Jelly on Medium, this list compiles the some of the wackiest information and most outlandish escapades of this major 20th century avant garde figure. Guns, the occult, literary experiments, heroin, ayahuasca, the Beatles, alien abduction...what wasn't Burroughs into? Now appearing on the Psypress UK site, this essay explores how the non-linear structure and phantasmagorical imagery of Burroughs' novel Naked Lunch owes a considerable debt to his hallucinogenic ayahuasca and majoun experiences in the early 1950s. 'I have a friend whom I shall call Brian who suffers from obsessive-checking syndrome...' This self-help style piece about the paradox at the heart of obsessive checking was inspired by browsing articles on quantum mechanics. The piece features in the anthology Out of the Shadows, published by the Muswell Hill Press in July 2015. Ayahuasca looms large in today's psychonautic zeitgeist, but way back in the early '50s Burroughs became one the first Westerners to explore its secrets, and its influence on his writing was profound indeed. Now republished on Psychedelic Press. Robert Dickins' first novel blends psychonautic experience and festival culture in a startlingly original and creative fusion. It's a work that anyone who wants to sample a slice of today's psychedelic zeitgeist should read. Jeanette Winterson's misery memoir tracks the territory of her first novel, Oranges Are Not the Only Fruit, but goes much further in exploring her struggle with the issue of being an adopted child. A very frank and revealing read. As a big fan of McEwan, I looked forward to his latest novel Sweet Tooth — especially as it's set in the 1970s, my favourite decade. Imagine my surprise when I got to the twist ending and found it uncannily similar to that of The Mad Artist. This piece explores my thoughts. Horatio Clare's memoir of bipolar disorder and 'cannabis addiction' is honest, unsparing and sometimes harrowing in its revelations, but then the writing itself, in the confessional tradition, has had an evident cathartic function for the author. Leaf Fielding's marvellous memoir gives extraordinary insight into the early days of acid counter culture and the dark years following the legendary Operation Julie raid. Bill Booker's 1970s Kerouacian acid memoir bears such an uncanny resemblance to The Mad Artist that Bill and I have hardly stopped talking about the similarities! Well, great minds think alike! David Shield's study of the interrelationship of fact and fiction in novels and memoirs so resonated with my own thinking that I came up with this piece, applying his perspectives to The Mad Artist and other drug memoirs. Stephen Smith's memoir of rampant dexedrine addiction and general craziness has proved a perennial favorite, and it's sparked many a debate about the interface between factual reporting and sensationalism. A collection of essays by Albert Hoffmann, discoverer of LSD, and others, covering topics such as chemistry as alchemy, together with personal anecdotes about this remarkable and well-loved 20th century figure, who lived to the remarkable age of 102. In this important late Romantic era drug-lit classic, poet Charles Baudelaire discusses and compares the intoxicating effects of wine, hashish and opium, with many lyrical and incisive passages, displaying the influence of such substances on a great creative mind. Andy Roberts gives the British side of the LSD story, with tales of military experiments at the Porton Down chemical weapons facility, early examples of LSD psychotherapy and the more familiar ‘swinging ’60s’, the free festival movement and beyond. A study of how the blockbuster film trilogy will forever affect our future reading of the Tolkien novels. This Nicholas Royle novel is a wonderful fusion of crime, surrealism and film buff ephemera.